I have joked that since we moved to Indiana I have gotten lost more times that I EVER did in any other city. Because every cornfield looks exactly the same. I’m always questioning if I turn left at this cornfield or the next cornfield or the next one. I can’t drive for more than 5 minutes without passing yet another cornfield. So I’m choosing to embrace the fields of tall green stalks that make it impossible to see road signs and cross streets. Here’s to corn – and popcorn too! 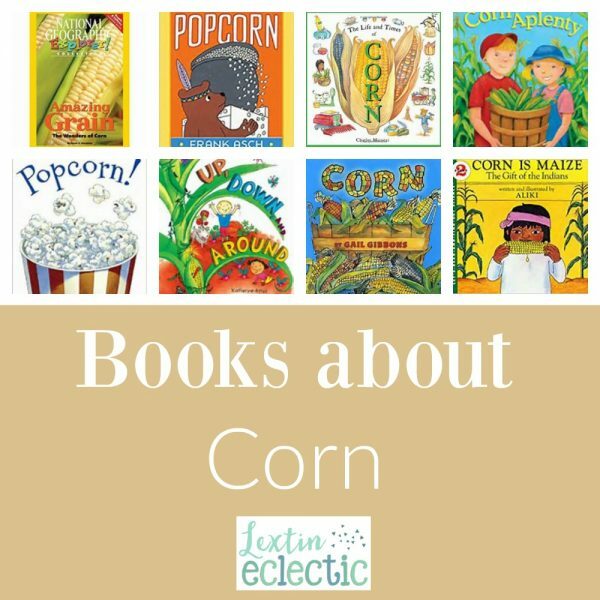 Enjoy some of our favorite books about corn this fall! Popcorn, corn on the cob, cornbread, tacos, tamales, and tortillas—all of these and many other good things come from one amazing plant. This book offers a cornucopia of information about the history of corn as well as details concerning planting, cultivation, harvesting, and its many uses. A book about what popcorn is, how it’s stored, and how it’s cooked, plus legends and recipes. How does a corn seed become corn on the cob? Follow each step in nature’s cycle – from planting to picking and eating – in this fascinating book! The LIFE AND TIMES series focuses on the science, uses and history of American’s most prevalent crop and is full of fun facts and trivia. Sam’s Halloween party is popping—with a massive amount of popcorn! Find out how he and his friends handle the delicious surplus. Pull up a chair and dig in! POPCORN is chock-full of tidbits about one of America’s favorite snack foods. Learn what makes popcorn pop, how Native Americans liked their popcorn, and how television almost wiped out popcorn’s future. Two children watch a local farmer grow a crop of corn, and as the corn develops—from seed to harvest time—so does the friendship between the children and the farmer. A big pot, some heat, and lots of popcorn. . . . When the corn starts popping, the fun gets hopping for a boy, a girl, and their grown-up pals, who tend the stove. But when will the popping stop? From seeds dropping into soil to corn bursting from its stalks, from children chasing butterflies to ants burrowing underground, everything in this vibrant picture book pulses with life —- in all directions! Learn about why corn is one of our most important crops and about the variety of ways people grow and use corn. You could hardly blame Dexter, ordinarily a well-behaved young dragon, for showing off when he suddenly found that he could make clouds of smoke. The temptation is irresistible, but Dexter quickly becomes insufferable. Soon Dexter has no friends left. He is a very lonely dragon indeed, until quite by accident he discovers a way his talent can be used to win back his playmates.